Congratualtions! You’ve started your own business and you’re really excited about getting things rolling. Once you are on that inspiration high, it’s hard to come back down to earth. You’re like a bullet train, full of energy and excitement. Then you realize you need a website. So far, you’ve done everything yourself, so why slow down now? Do-It-Yourself Websites are all the rage and everyone else is doing it so why shouldn’t you? Even if you find the perfect theme and it just happens to operate flawlessly upon execution, you still need to build it. Websites require written content which must be original (if you plagiarize it, you will get caught). You have to add pictures that are sized correctly, appropriate to your site and again – original. You can’t just copy any old picture off the internet. That is called content theft, which is applied to written content as well. And don’t think you’ll get away with it, because there are programs working 24/7 just to catch those kind of cyber thieves. You can get photos from a stock photography site, but it takes a lot of time to search for the right images, and you have to know how to download and implement them correctly. In a nutshell: You have a theme to download, set up, and customize. You have to write content. You have to search for and choose pictures. Shouldn’t you be concentrating on building your business and getting some clients? 2) Which One Do I Choose? Where do you go for a theme? Free themes are available from WordPress. Cheap themes are available from … I don’t want to mention any names, but there are hundreds of sites that offer them. Suppose you finally choose WebMaker 2000; next you have to decide what type of website you want – and you’d better make sure you get the right one or you’ll be starting from scratch again. Do you want a WordPress database, or Joomla or Drupal? Do you need an e-commerce website? Text-based or photo-based? Blog-based or showcase? If you have no idea what I’m talking about, you need to stop now and hire a professional! Most DIY website companies will tell you it’s as easy as 1-2-3. It isn’t. They lie. “Simply download our fully operational template and you’ll be up and running in no time!” If it acts and talks like a used car salesman, it’s probably a used car salesman … and we all know how trustworthy they are. Most DIY themes are CMS sites. They are user friendly and made specifically for people who are not web designers. But you still have to get it set up and working first. The process begins with you downloading and moving the files to your host, under your domain name. But before you can actually access the site, you need to set up your database, name it properly and enter that information into the set up page for your new site. For someone who doesn’t know what they’re doing, the process can take hours. You’re already frustrated and tired but you may feel the need to justify the $79.95 you splurged on for this theme. And you haven’t even begun building it yet. Once you have successfully downloaded, installed, and set up your theme and accessed the admin panel, you can begin designing (or customizing) it. Many themes allow you to choose custom colors, fonts, widgets and even the position of key action blocks. Then there are others that don’t allow this much customization. No or little customization means that you are going to get a cookie-cutter look that will be exactly the same as a hundred other sites. Too much customization takes a lot of time, experimentation and re-doing as you find out what works and what doesn’t. When you realize that the way you want your site to look isn’t something built into the customization panel, you have to start all over by choosing a new theme that allows the customizations you want, or you have to go into the basic programming and make changes to the code. But the whole point of doing this yourself was because it was going to be easy and cheap, right? Adding pictures is the easy part. Or so you thought. You’ve finally gotten the photos of your stuff to sell, or taken some beautiful panoramas for your background. Or maybe you purchased them from a stock photography site. Now you need to size them properly. Pictures can be sized down, but they can’t be sized up. Expanding a small picture results in fuzzy or pixilated images that look unprofessional, warped or just plain crappy. In order to make a picture smaller, you actually have to re-size it with software. Dragging the corner to make the picture physically smaller doesn’t make it smaller to the program, and this type of adjustment can slow down your website making it take forever to load. Visitors won’t wait that long! Did you add alternate tags and descriptions to all your photos? If not you’re missing out on very important SEO – which brings me to my next point. SEO stands for Search Engine Optimization. SEO is what helps search engines index your website. If you type “plumber” into Google, you will receive a list of plumbers in your immediate area. The top results in a search are there because they have really good SEO on their website. Ask yourself this question: when you have done an internet search for something, have you ever gone to the results on page two? Maybe. Page three? Not likely. Page ten? Definitely not. Most people get their search answer from within the top 5 results. No one goes to page ten, but if you decide to build your own website, that’s probably where you’ll end up. If you’re lucky. SEO involves more than just a few strategically placed keywords in the content. 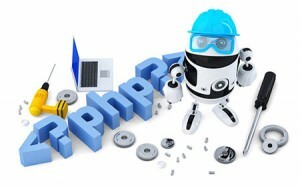 Most of the really good SEO comes from the programming side of the web pages. DIY websites offer very little in the way of SEO. Without SEO, people will only be able to find you if they already know the name of your business, but if you’re descriptions are not correct – not even then. When you’ve realized that you forgot something, you shrug and say, “That’s okay, I’ll add it later.” Putting a band-aid over a mistake, error or omission is a piece-meal approach to building a website. Piece-meal websites look just like that – piece meal. You add a little of this and a little of that and next thing you know your McMansion looks like a hillbilly shack in the Ozarks. 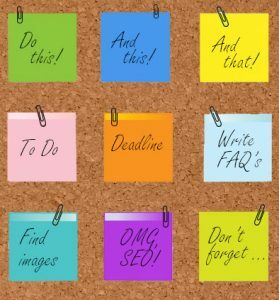 You may have forgotten about all those little things that could make or break the credibility of your website: social media links, blog feeds, contact information, promotionals and even menus (yes, really!). I was going to call this section “There Will Be Bugs!” because there always are. Nothing ever works flawlessly exactly the way you want it to. Theme providers always offer support, but will they really be there when you need them, and if so will they speak English? Even professional programmers sometimes get frustrated with bugs that take real know-how to fix them. Aside from bugs, however, is another issue of functionality. There is a new trend in websites that is flashy, classy-looking, sleek and modern. They are those long, one-page websites that have multiple sliding backgrounds with beautiful panoramas that fill a huge monitor screen. I have to admit, they are gorgeous – but even a super model wakes up without her make-up on. At some point you will realize that no matter how pretty it looks, it doesn’t work for you. Website format has great dependency on the type of business you have. One page websites are desperately lacking in SEO, and you don’t always have the same navigational structure (which makes your site user-friendly) available to you. Choosing the right format is like choosing a spouse – you want one that is going to be with you for the long haul. Fad websites are just another one-night stand. Designing a site that is attractive and functional for your purpose takes a lot of work and know-how. There will still be things you need, that you don’t know how to do. For these things, you will need a programmer or an “IT Guy.” Certain elements create havoc for even the best programmers. Photo galleries are a good example. You can’t just download a gallery plug-in, activate it and voila! Unfortunately, some plug-ins refuse to work with some themes. Sometimes themes are created specifically so that you can’t use other plug-ins with them – you end up having to buy the custom plug-in that goes with that theme. The same goes for forms, like those you see on a sign-up or contact page. Chat features, spam control, social media feeds, e-commerce shopping carts (the worst! ), sliders and many more fit into this bees nest of technical nightmares. The point is, that after all that work, you just may realize that for what you’ve lost in sales while trying to construct this monstrosity, you could have paid a professional for a beautiful website that is fully functional, has great SEO and is bringing in more business than you thought possible. A well-built website programmed by a professional really doesn’t cost that much. Professionals are usually willing to work with you on that point, especially if it means that they won’t be de-bugging the aftermath of your little DIY website experiment!